These accolades reinforce the fact that you will not find a more qualified and trusted builder for your swimming pool than TLC Outdoor Living. Your imagination (and budget, of course) is the only limitation to what can be accomplished when you hire TLC to create your dream backyard escape. Owning a TLC Outdoor Living pool is like owning your own private resort, right in your backyard! You will be forever grateful that you chose the best in the business to create your masterpiece center of entertainment and relaxation for your family to enjoy for generations. If you are serious about creating the perfect backyard living space, you have only one clear choice on who to entrust that task to. TLC Outdoor Living is simply the BEST at what they do. When you want the best outcome, you should choose the best builder. TLC makes that choice easy for you. With their proven track record, designs, vast experience and good old fashion “Know How”, you will find yourself the envy of all who chose an inferior builder. Known for crafting some of the best work in Texas, TLC Outdoor Living’s showroom is located just outside of Houston, and Cypress, in Katy, Texas. TLC Outdoor Living is the proven best choice of Houston pool builders. Stop by for a visit of their new, state-of-the-art store front, located at I-10 and Hwy 99. Inside the luxurious TLC Store, you will be able to see design ideas for spas and hot tubs, grills, patios, pools, as well as unique and stylish accessories. You can even enjoy the “wet experience”, which is TLC Outdoor Living’s unique opportunity for you to demo the most cutting-edge technologies in the latest Spa designs. I do not know of another store that offers an actual sit down inside of a working spa. They will even provide you with some trunks if you need them! You will have to bring your own tropical drink. While visiting the showroom, you will be able to speak with a knowledgeable member of the staff, who will cheerfully help you develop your swimming pool and patio concept and guide you on the process of creating or enhancing your outdoor Dream Space. From Concept to Creation, TLC Outdoor Living will work right along and beside you to create your ideal backyard getaway. 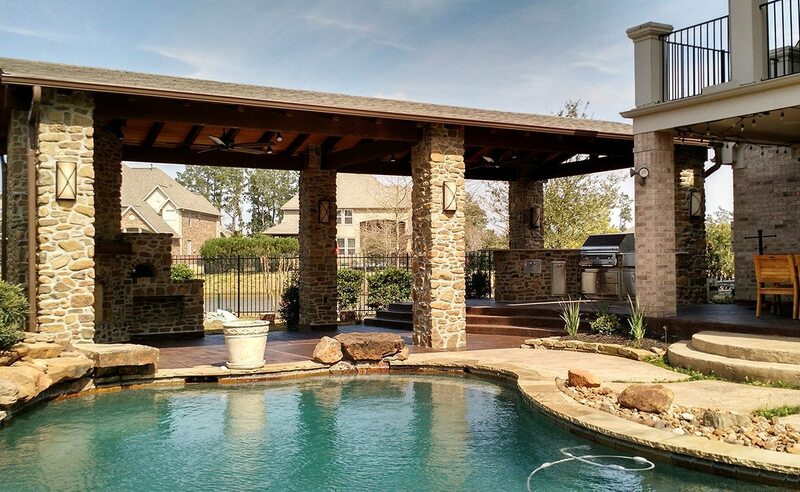 From pools and spas, to patio kitchens and hangouts, TLC is the builder that Texas can trust to create a living space for years of relaxation and enjoyment. Your new swimming pool scape and backyard retreat will wow guests and provide a welcome escape from the intense heat of Texas summers. They can even provide heated options, so that you can enjoy your pool year round! Your beautifully landscaped swimming pool will be designed to be a private retreat from the stress of everyday life. With multiple choices on lights, water features and deck furnishings, your swimming pool will pamper and provide a way to refresh, relax, sun bathe and entertain throughout the afternoon and evening. They will then create a computer-generated animation of actual pool design and water features, so that you can see the finished project goal before the construction of your swimming pool ever begins. You will be able to observe the level of dedication and adherence to the quality of the work being done throughout the entire swimming pool construction project. Your TLC Project Manager will work with you to coordinate the step-by-step process of your pool installation, including all necessary State and City inspections, HOA permissions, and any permits needed for insuring the approval of your new swimming pool construction. TLC Outdoor Living uses only the finest swimming pool products and manufacturers, insuring a long lived product that will exceed your expectations. They will guide you on decisions regarding pool types, filtration methods, and the myriad options that are available to the modern swimming pool owner. Upon completion of the install, TLC will work with you on the training and familiarization with the operation and understanding of your new pool’s care and equipment use. Even well after your first swim, TLC’s expert staff will always be available to answer any questions you may have during the lifetime of your swimming pool ownership. With decades of experience in creating beautiful landscapes, aquascapes, patio covers and decking, outdoor kitchens, and resort like pools, TLC Outdoor Living is your ideal partner in creating the outdoor paradise that you have always wanted.